This is a condition in which one's skin loses melanin, the pigment that determines the colour of the skin, eyes and hair. This often occurs when the cells that produce melanin die or no longer form melanin, causing white patches of uneven shapes to appear on the skin. Men and women are equally affected and this can develop at any age. Skin affected by Vitiligo is not itchy, and people who have it are usually well. However, the appearance of the skin can be worrying, especially if the face and hands are affected. 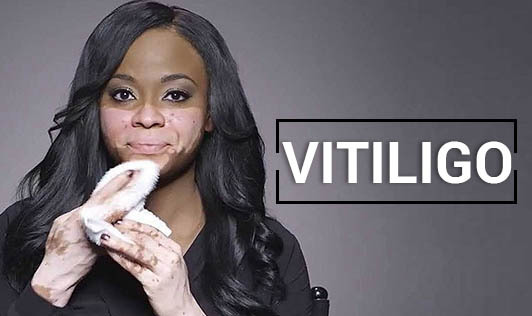 The severity of Vitiligo varies from person to person. Vitiligo may be caused due to autoimmune disorders or a family history of Vitiligo. In some cases, a single event such as emotional distress or sunburn could trigger the condition. Even a pigment loss can occur in someone who has had a melanoma, a malignancy of the cells that produce melanin. However, none of the theories have been proved as a definite cause of Vitiligo. Contact your doctor if areas of your skin, eyes or hair lose colouring. Although there is no cure for Vitiligo, treatment can help to stop or slow down the process of depigmentation.